Annual events in June & December. Happy Father’s Day to all the dad’s out there who are remembering a child today. 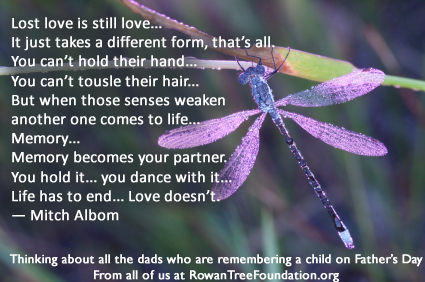 If you know a dad whose child has died, please reach out and let them know you’re thinking about them and that you remember. They are still a dad. This quote says it all. If you have not yet read any of Mitch Albom’s books, you might give them a try. RTF is all volunteer and with no paid staff, 100% of your donation goes to our programs and events. Please donate today.